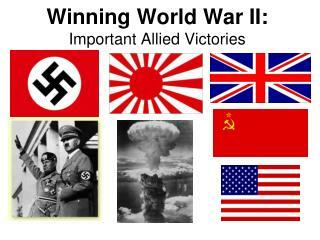 Winning World War II: Important Allied Victories. 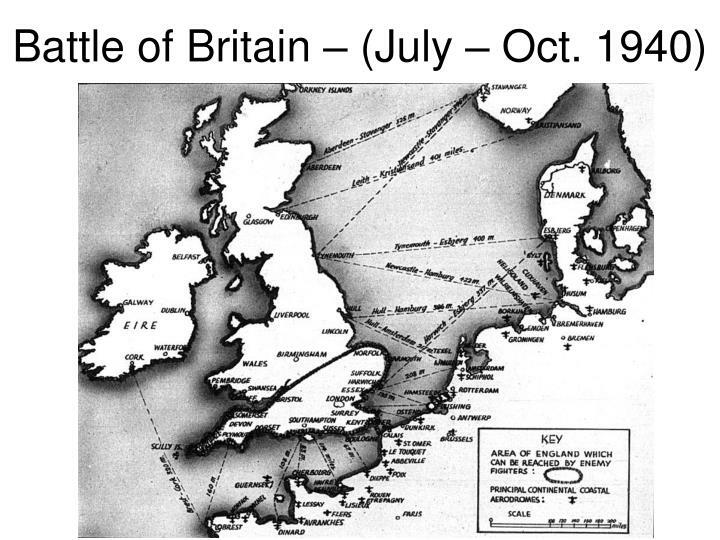 Battle of Britain – (July – Oct. 1940). 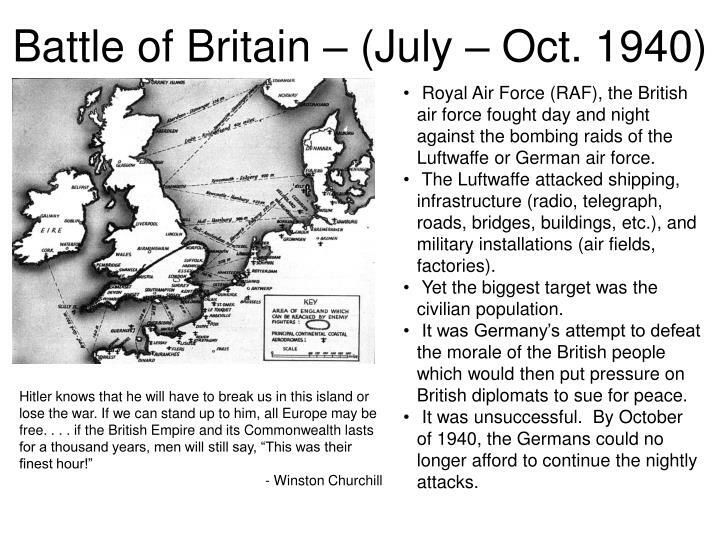 Battle of Britain – (July – Oct. 1940). Royal Air Force (RAF), the British air force fought day and night against the bombing raids of the Luftwaffe or German air force. Royal Air Force (RAF), the British air force fought day and night against the bombing raids of the Luftwaffe or German air force. 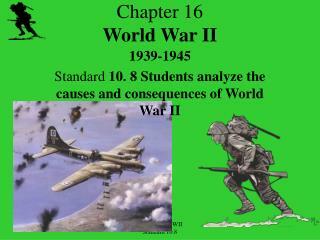 The Luftwaffe attacked shipping, infrastructure (radio, telegraph, roads, bridges, buildings, etc. 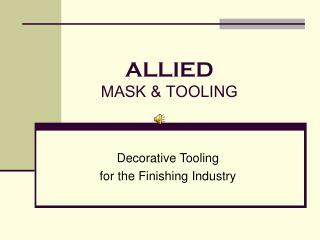 ), and military installations (air fields, factories). Yet the biggest target was the civilian population. It was Germany’s attempt to defeat the morale of the British people which would then put pressure on British diplomats to sue for peace. It was unsuccessful. 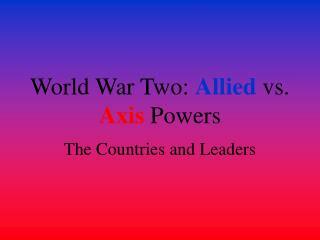 By October of 1940, the Germans could no longer afford to continue the nightly attacks. 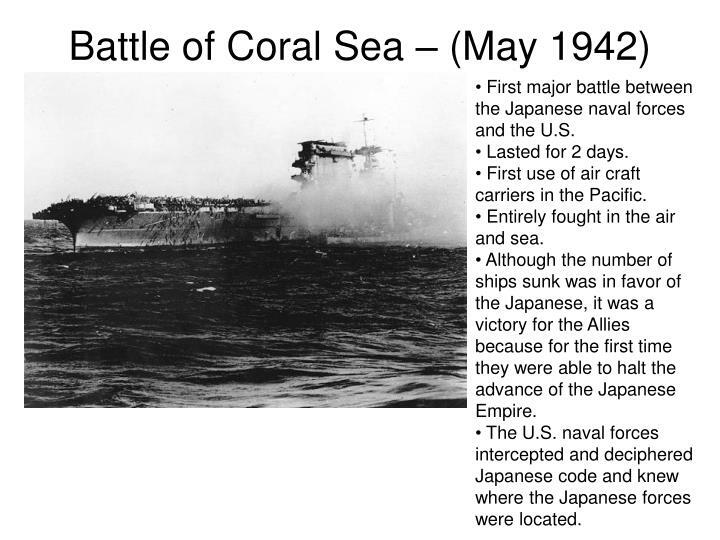 First major battle between the Japanese naval forces and the U.S.
First use of air craft carriers in the Pacific. Entirely fought in the air and sea. 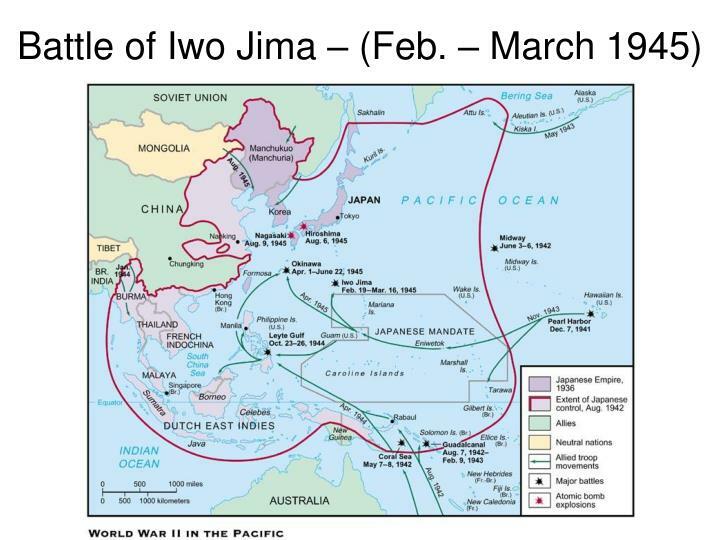 Although the number of ships sunk was in favor of the Japanese, it was a victory for the Allies because for the first time they were able to halt the advance of the Japanese Empire. The U.S. naval forces intercepted and deciphered Japanese code and knew where the Japanese forces were located. Used the same deciphering code that was intercepted during the Battle of Coral Sea. The battle lasted 4 days. 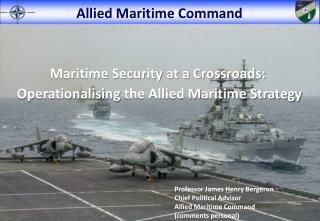 Was fought entirely with naval and air forces. Allowed for the Doolittle Raids. 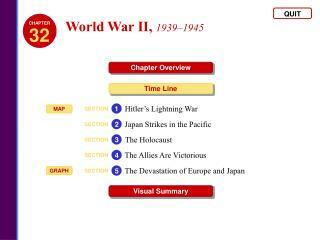 Demonstrated that the Japanese were not invincible and could be defeated. 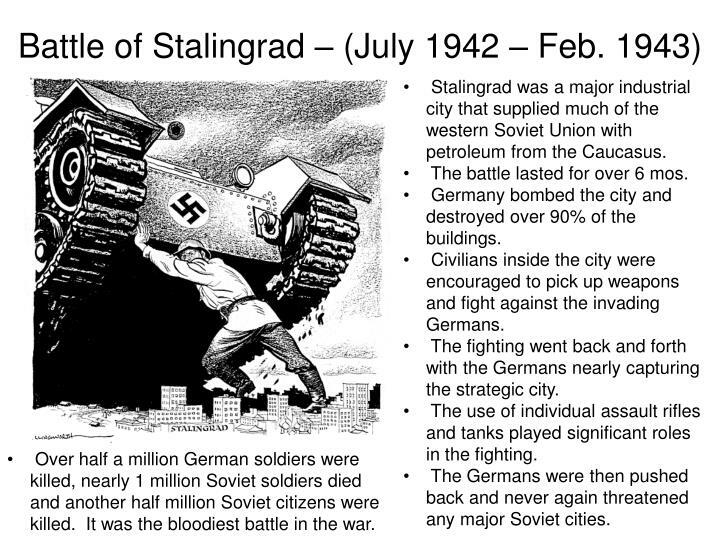 Stalingrad was a major industrial city that supplied much of the western Soviet Union with petroleum from the Caucasus. The battle lasted for over 6 mos. 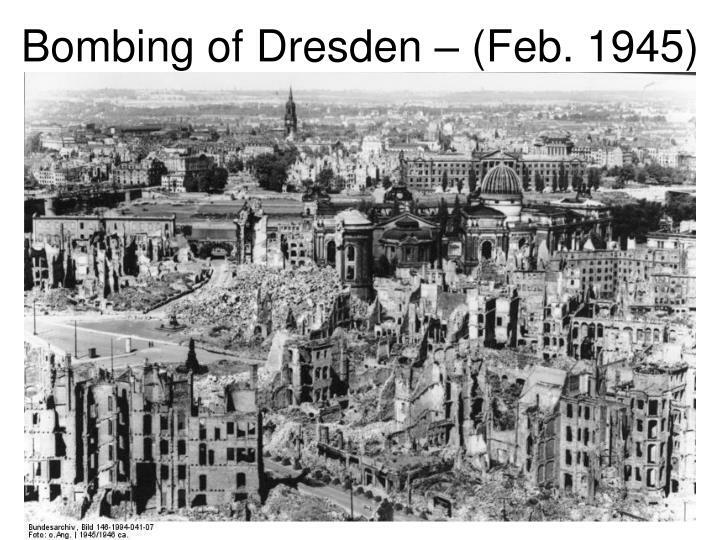 Germany bombed the city and destroyed over 90% of the buildings. 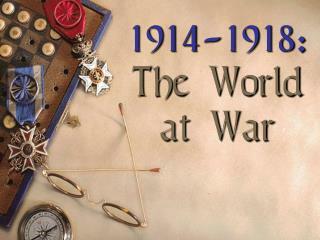 Civilians inside the city were encouraged to pick up weapons and fight against the invading Germans. The fighting went back and forth with the Germans nearly capturing the strategic city. The use of individual assault rifles and tanks played significant roles in the fighting. 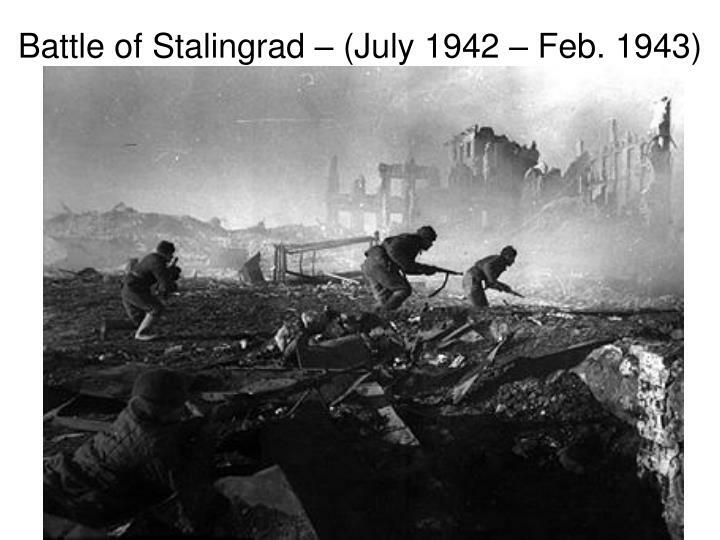 The Germans were then pushed back and never again threatened any major Soviet cities. 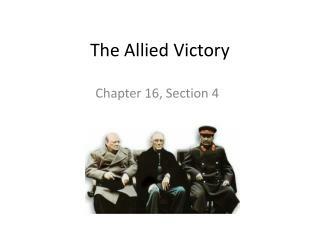 Over half a million German soldiers were killed, nearly 1 million Soviet soldiers died and another half million Soviet citizens were killed. 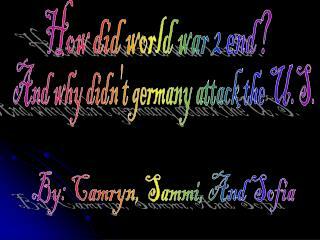 It was the bloodiest battle in the war. 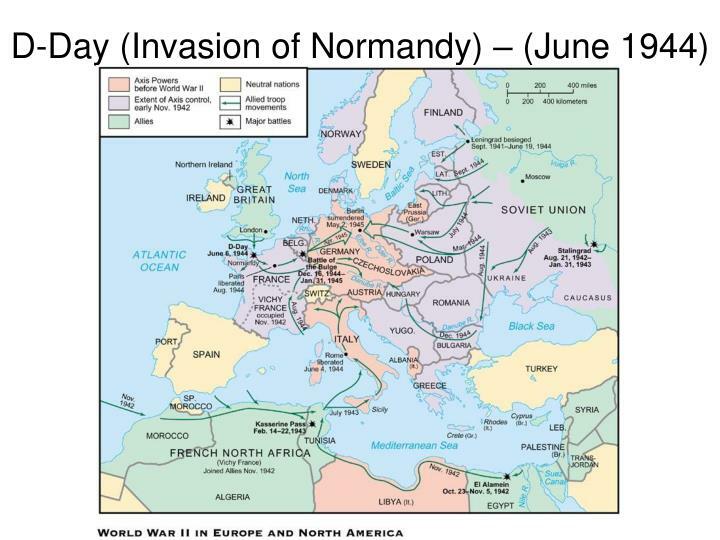 First invasion of Europe by Allied forces (most fighting had been done in the air and sea and North Africa). 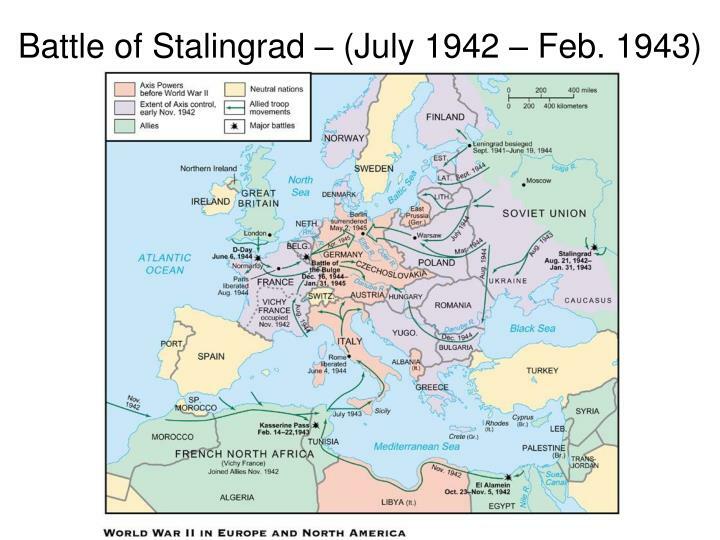 Italy had been allies with Nazi Germany prior to the war. 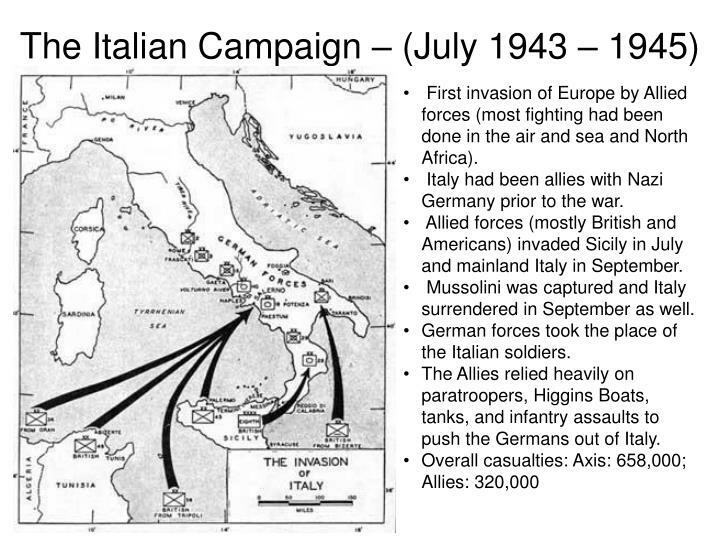 Allied forces (mostly British and Americans) invaded Sicily in July and mainland Italy in September. Mussolini was captured and Italy surrendered in September as well. German forces took the place of the Italian soldiers. 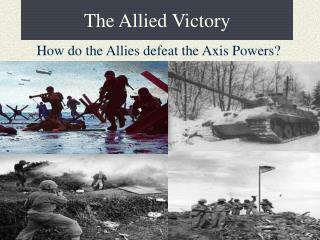 The Allies relied heavily on paratroopers, Higgins Boats, tanks, and infantry assaults to push the Germans out of Italy. 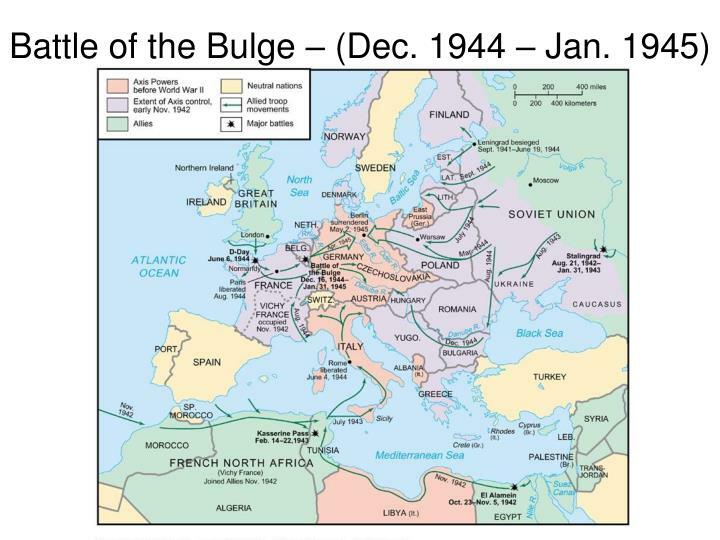 By 1942 Hitler had created a formidable “Atlantic Wall” to defend the Atlantic coast. 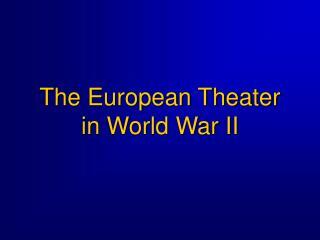 The world knew that an amphibious invasion had to happen along the Atlantic coast in order to defeat Nazi Germany. 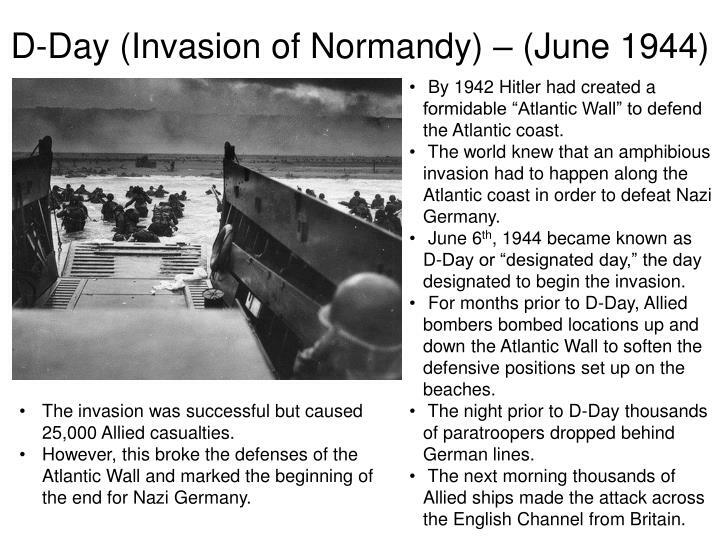 June 6th, 1944 became known as D-Day or “designated day,” the day designated to begin the invasion. 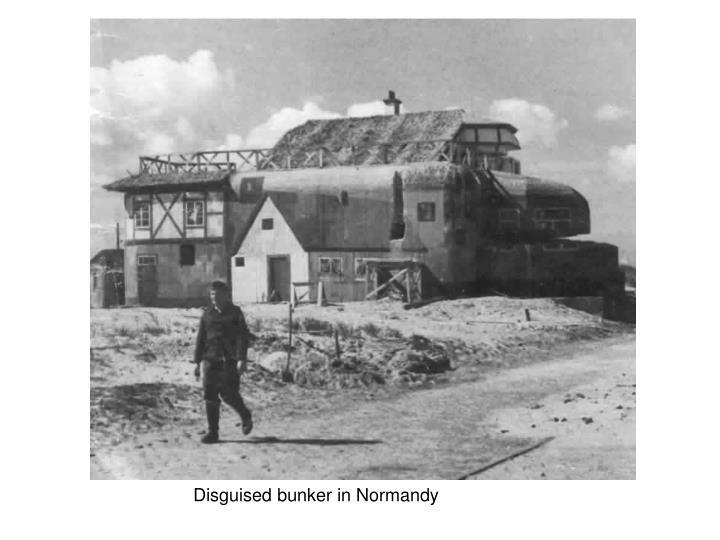 For months prior to D-Day, Allied bombers bombed locations up and down the Atlantic Wall to soften the defensive positions set up on the beaches. The night prior to D-Day thousands of paratroopers dropped behind German lines. The next morning thousands of Allied ships made the attack across the English Channel from Britain. 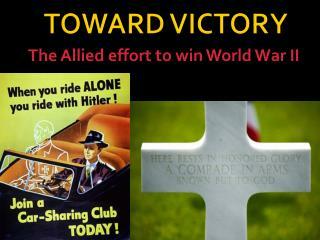 The invasion was successful but caused 25,000 Allied casualties. 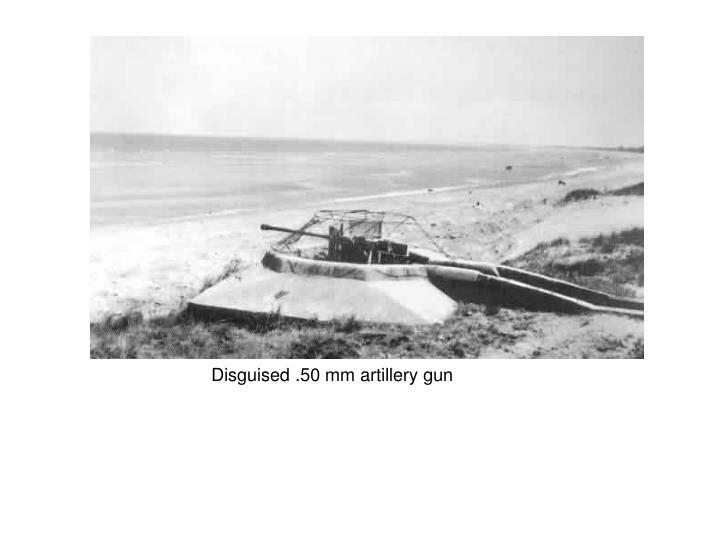 However, this broke the defenses of the Atlantic Wall and marked the beginning of the end for Nazi Germany. 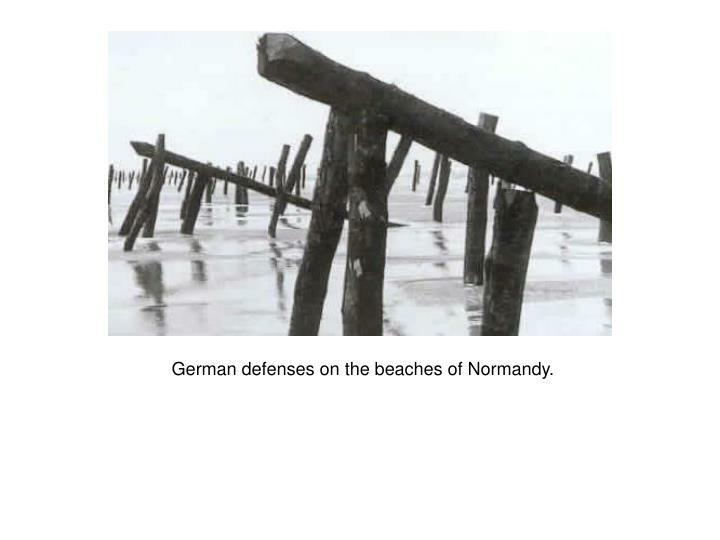 German defenses on the beaches of Normandy. 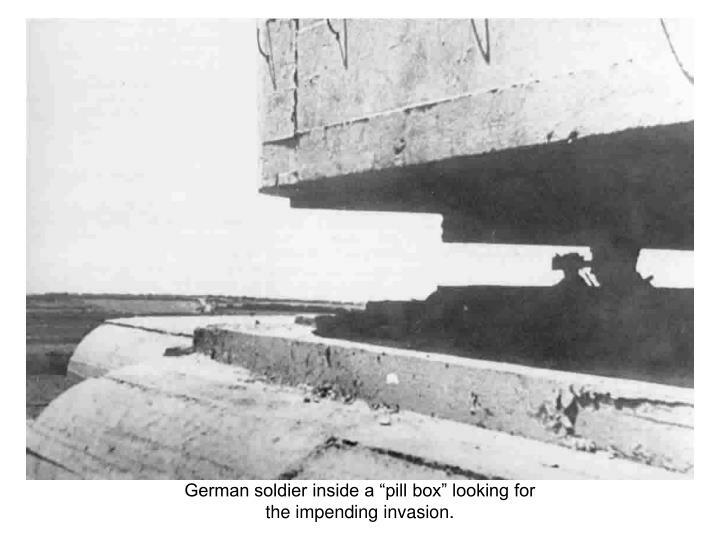 German soldier inside a “pill box” looking for the impending invasion. 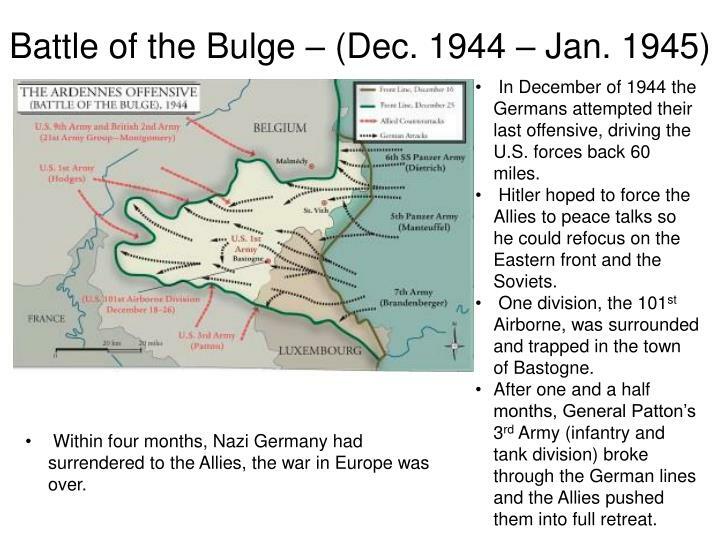 In December of 1944 the Germans attempted their last offensive, driving the U.S. forces back 60 miles. 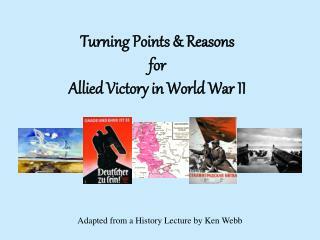 Hitler hoped to force the Allies to peace talks so he could refocus on the Eastern front and the Soviets. One division, the 101st Airborne, was surrounded and trapped in the town of Bastogne. 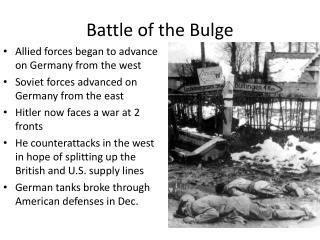 After one and a half months, General Patton’s 3rd Army (infantry and tank division) broke through the German lines and the Allies pushed them into full retreat. 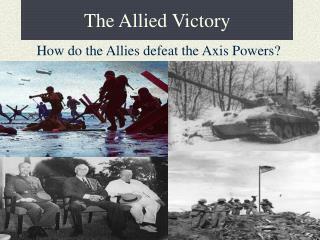 Within four months, Nazi Germany had surrendered to the Allies, the war in Europe was over. Both a strategic island and a symbolic victory due to the fact that it was the first battle fought on Japanese homeland. One of the final pieces of the U.S. “Island Hopping Strategy” in the Pacific. 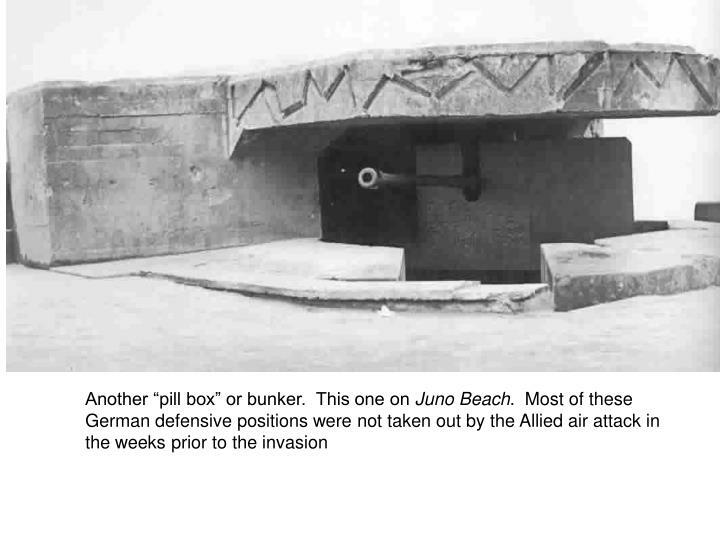 For years, the Japanese defenses had been established, creating hundreds of bunkers and “pill boxes” and tunnels that extended throughout the island. 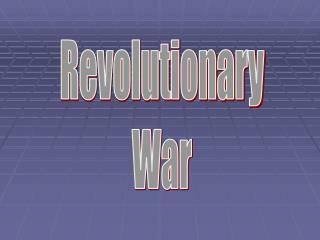 This was the largest amphibious invasion in the history of warfare. 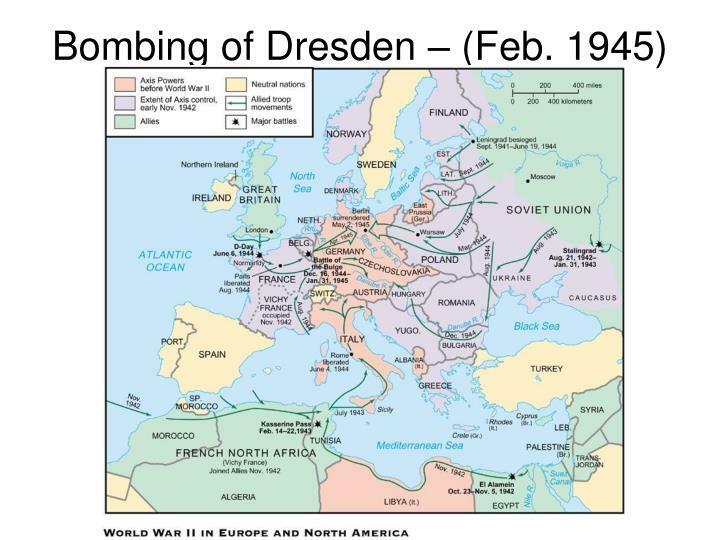 The use of bombers to destroy the defenses did little. U.S. forces relied upon Higgins Boats to land on the beaches as well as tanks and the use of napalm to destroy vegitation. 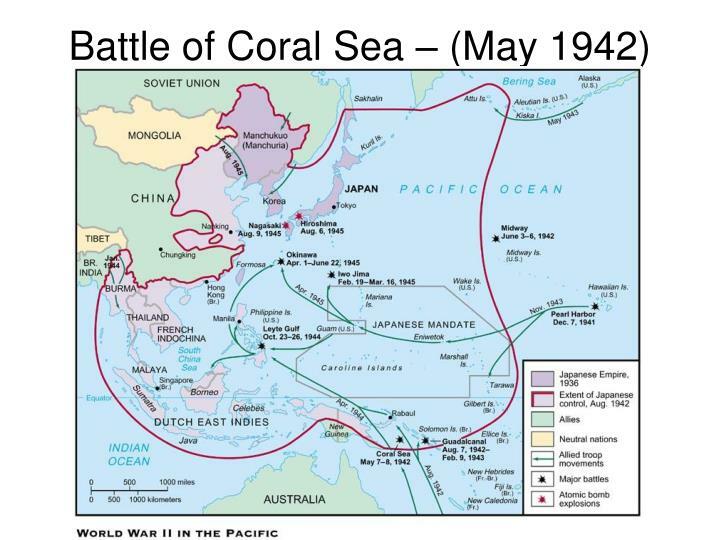 After 36 days of fighting, the U.S. forces overwhelmed the Japanese soldiers. 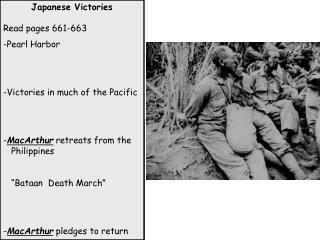 Of the nearly 22,000 Japanese soldiers, only 250 were taken alive (most fighting until death, many committing suicide). There was nearly 27,000 U.S. casualties. 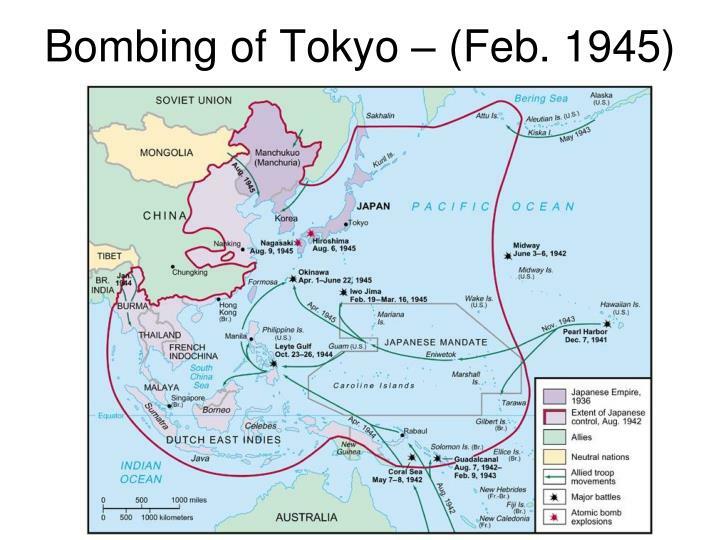 By early 1945, the U.S. had “Island Hopped” close enough to begin bombing mainland Japan, including the capital city of Tokyo. 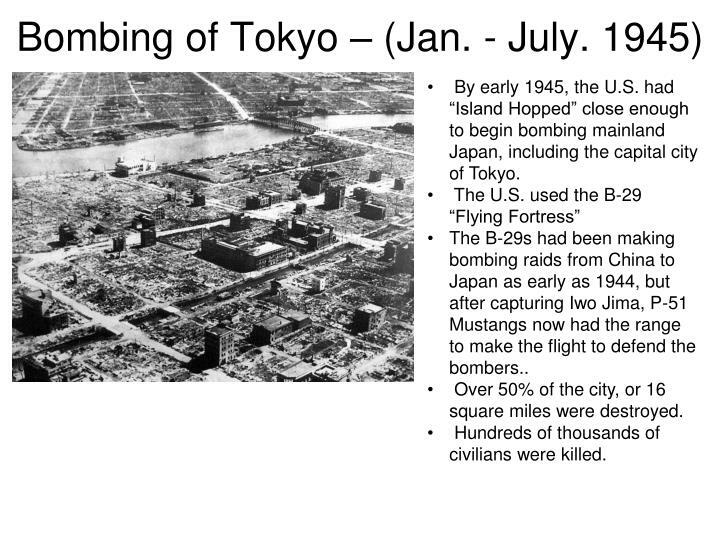 The B-29s had been making bombing raids from China to Japan as early as 1944, but after capturing Iwo Jima, P-51 Mustangs now had the range to make the flight to defend the bombers..
Over 50% of the city, or 16 square miles were destroyed. Hundreds of thousands of civilians were killed. 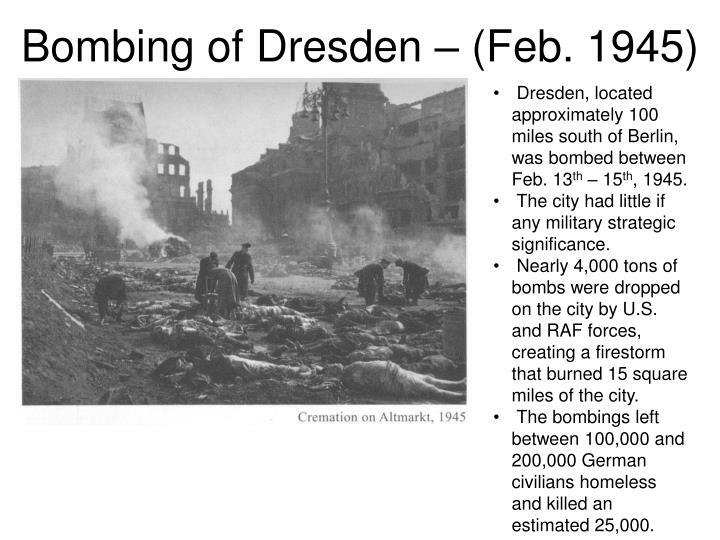 Dresden, located approximately 100 miles south of Berlin, was bombed between Feb. 13th – 15th, 1945. 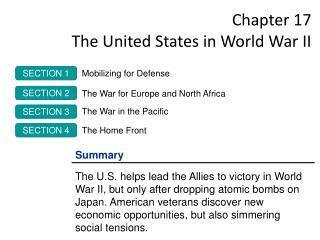 The city had little if any military strategic significance. Nearly 4,000 tons of bombs were dropped on the city by U.S. and RAF forces, creating a firestorm that burned 15 square miles of the city. The bombings left between 100,000 and 200,000 German civilians homeless and killed an estimated 25,000. 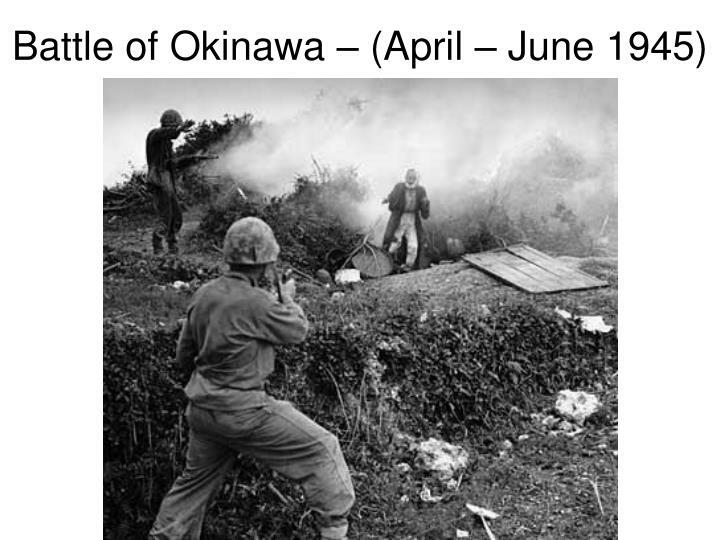 Okinawa, like Iwo Jima, was actual Japanese territory. Japanese civilians lived on the island. 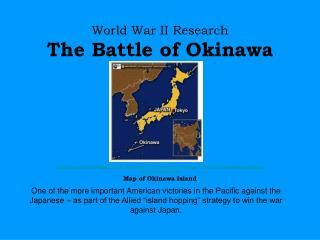 Okinawa was the last land battle fought in the Pacific theater and was located only 340 miles from mainland Japan. It was fought for 82 days. 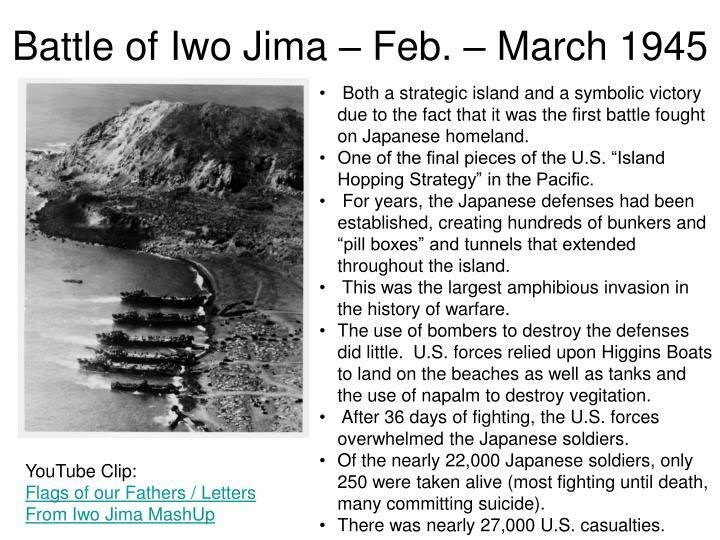 The fighting was similar to Iwo Jima (amphibious invasion and the use of Higgins Boats, use of bombers on the strong defenses, etc.). 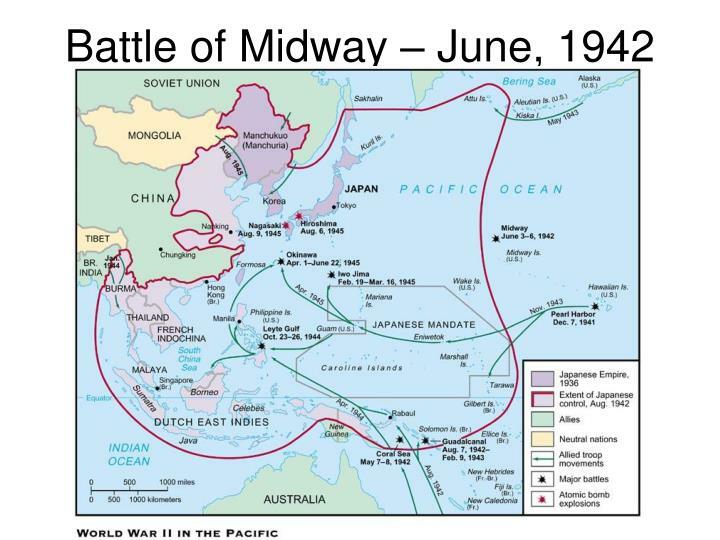 A significant air and sea battle took place off the coast, as the Japanese attempted to defend their homeland. 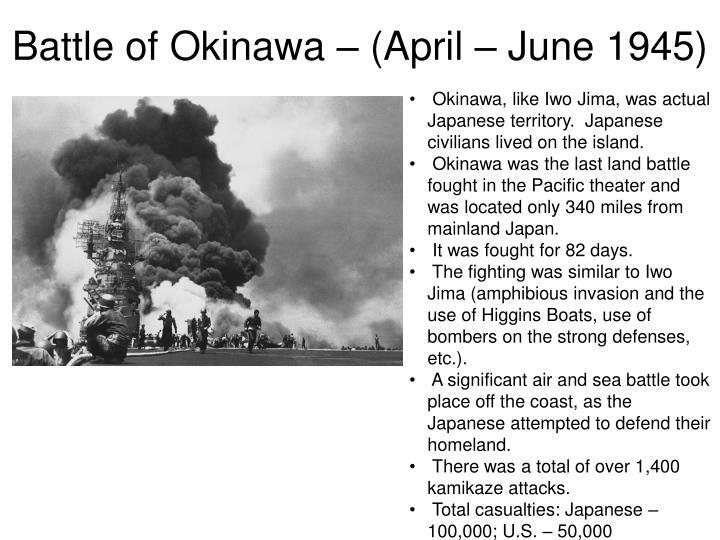 There was a total of over 1,400 kamikaze attacks. The Manhattan Project, the title given to the U.S. military’s research and development program for the production of atomic weaponry, cost over $2 billion. Although Hiroshima was the home of military personnel, it was also populated by hundreds of thousands of civilians. 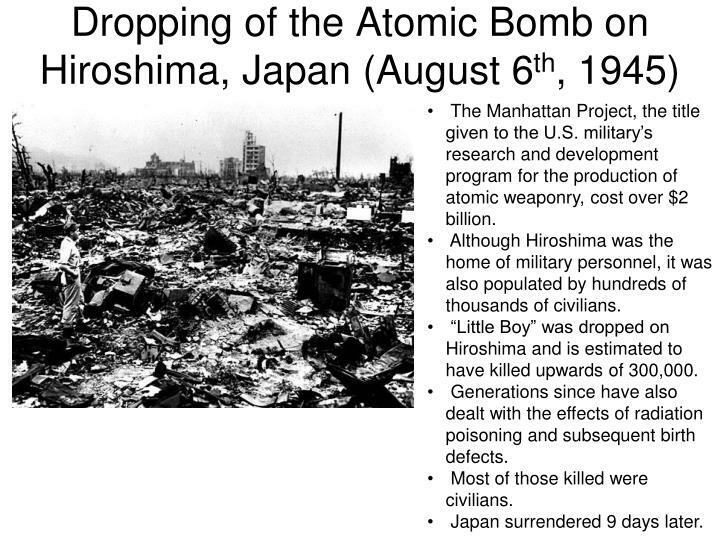 “Little Boy” was dropped on Hiroshima and is estimated to have killed upwards of 300,000. 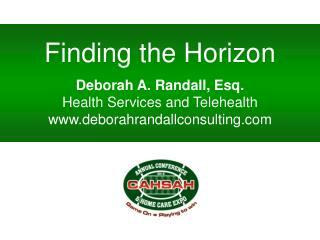 Generations since have also dealt with the effects of radiation poisoning and subsequent birth defects. Most of those killed were civilians. 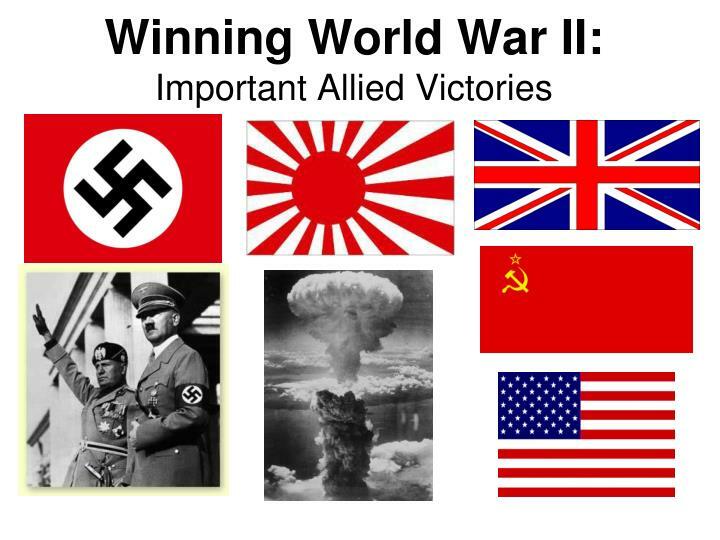 Japan surrendered 9 days later. 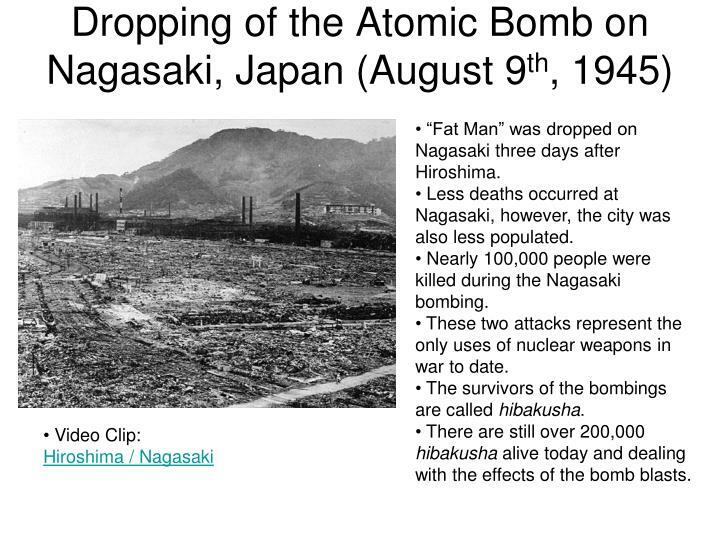 “Fat Man” was dropped on Nagasaki three days after Hiroshima. Less deaths occurred at Nagasaki, however, the city was also less populated. Nearly 100,000 people were killed during the Nagasaki bombing. These two attacks represent the only uses of nuclear weapons in war to date. 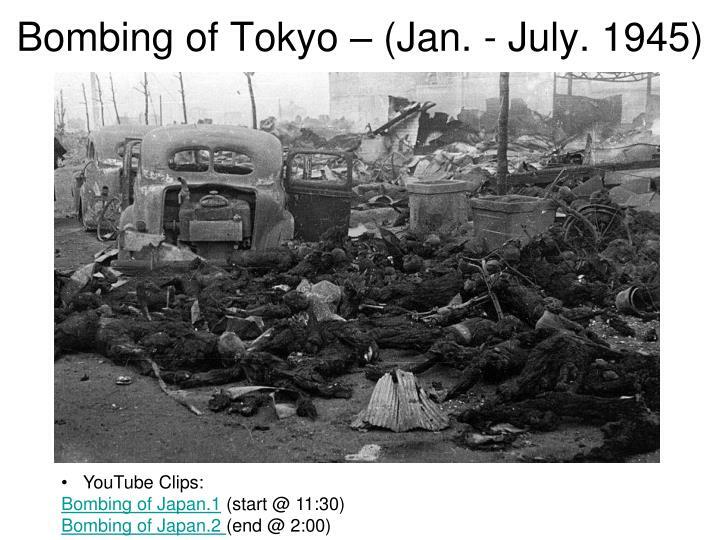 The survivors of the bombings are called hibakusha. There are still over 200,000 hibakusha alive today and dealing with the effects of the bomb blasts. 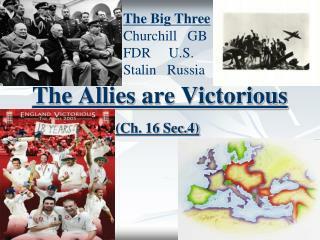 Victory in Europe and the Pacific Section 3 -How did the allies defeat the axis powers? 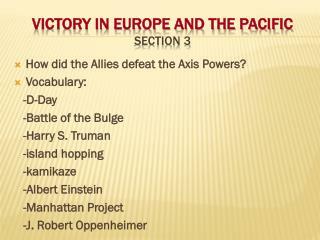 vocabulary: -d-day -battle of the bulge -harry s. truman -island hopping -kamikaze -albert einstein -manhattan project -j.